That was me about three weeks ago when I decided to try to use Edmodo with my Resource Room. My original goal was to get them used to signing into the computer, logging into Edmodo, and typing a reply (hopefully with capitals and punctuation). 1. I loaded a picture on Edmodo. 2. I gave these directions: Ask three questions about the picture. Answer two of your classmates’ questions. Use capitals and periods. 3. I set them loose and didn’t fuss about their grammar, punctuation, etc. I was happy to see them responding and interacting and looking at their question words. Almost everyone completed the task in the allotted time. Class ended and when I returned to my room, my iPhone had 47 notifications from Edmodo! 4. During my prep period, I logged into Edmodo and used the Screen Capture Tool in SMART Notebook and copied their work. All 47 replies. 5. I created some editing icons for punctuation and capitalization and included a smiley face. Fast-forward to the next day for our Bell Ringer…. 6. We edited those sentences and man, were they engaged! My room is a safe place and no one was embarrassed about their mistakes. They gracefully came to the board, made their corrections with my editing icons, or rewarded themselves with a smiley face. 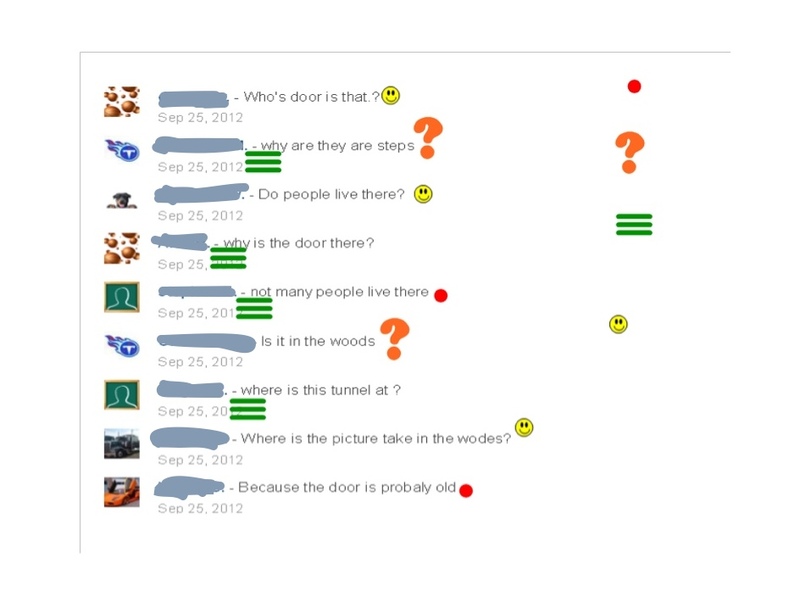 The photo prompt for this Edmodo discussion was a spooky door in the middle of the woods. During this activity, I had to give a mini-lesson on how to use the shift key for capital letters and question marks by putting a photo of our same keyboard on the SMART Board. I made students come up and practice “holding down” the shift key and then hitting the question mark. The best part came when we returned to the lab later that week and I provided another photo prompt with the same directions. My kids were excited about writing and they were recognizing their mistakes and they were fixing them! Imagine their delight when on our second day of “Edmodo Editing” we had twice as many smiley faces! We’ve done a few more photo prompts. On the fourth one, I told them I would be taking a grade on their work. The easiest way for me to do this was to print the post and all the replies. I cut them into strips and put them in piles. I then gave them a percentage on their use of capitals and punctuation. One girl did three sentences and another did 12 so this was the only fair way to do it. (Grading writing is always tricky for me.) I can also use these work samples for their IEP objectives. I see this activity evolving into bigger and better writing and editing experiences throughout the year. And to think it all happened somewhat accidentally…. Do you use Edmodo or something similar? You could do a book chat. We tried it a few years ago with Moodle but it never took off. Maybe we should try it again now that we are using Edmodo.